Be the first to share your favorite memory, photo or story of Peggy Sue. This memorial page is dedicated for family, friends and future generations to celebrate the life of their loved one. 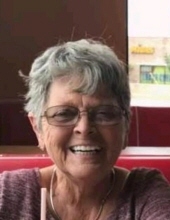 Peggy Sue Stidam Oswalt, 69, of Hattiesburg passed away on February 4, 2019 at Forrest General Hospital. Visitation will be Sunday, February 10, 2019 from 1 P.M. until the memorial service at 2 P.M. at Sandy Run Worship and Praise Center. Mrs. Oswalt was a business owner and community leader. She enjoyed singing gospel music and helping people. She had many friends who remember her contagious smile, and many who were touched and saved by her angelic voice. She made many appearances to cities, towns and states for gospel events, revivals and often her music was played on WBKH radio. She was preceded in death by her mother, Grace Nicholas; her father, James Stidam; and two great grandchildren, Cameron Lee and Trevor Mackenzie Oswalt-Sumrall. She is survived by her husband of fifty-three years, T. G. Jerry Oswalt Sr. of Hattiesburg; her three children Lisa Oswalt (Michael) Neldon of Hattiesburg, Thomas G. Oswalt, Jr. of Hattiesburg, and Beneta Oswalt (Kevin) Bottorf of Clinton; eighteen grandchildren; twenty great grandchildren; her sister, Betty Mitchell of Indianapolis, IN; her brother Robert R. Stidam of Hattiesburg; and numerous nieces, nephews, great nieces, great nephews, and great great nieces and nephews. To send flowers or a remembrance gift to the family of Peggy Sue Stidam Oswalt, please visit our Tribute Store. "Email Address" would like to share the life celebration of Peggy Sue Stidam Oswalt. Click on the "link" to go to share a favorite memory or leave a condolence message for the family.